Irises of the section Oncocyclus grow throughout the Middle East and are distinguished by conspicuously large, mostly dark flowers on separate stems. Ten species of this section have been recorded in Israel and adjacent countries. All are found in a very small range. These flowers are a focal point for nature lovers during the flowering season and are a symbol for nature conservation in Israel and Jordan. All eight Israeli species of Oncocyclus irises are endangered plants. Negev iris is one of the most threatened species of this group. This beautiful plant has suffered in recent decades mainly from disturbance of its habitat by new construction, intensive agriculture and grazing. Research is currently being conducted by the Israel Nature and Parks Authority in collaboration with the Ben-Gurion University of the Negev. The project includes rescuing rhizomes of some endangered iris species from threatened habitats, propagation in captivity, and relocation for the creation of new populations in protected areas. 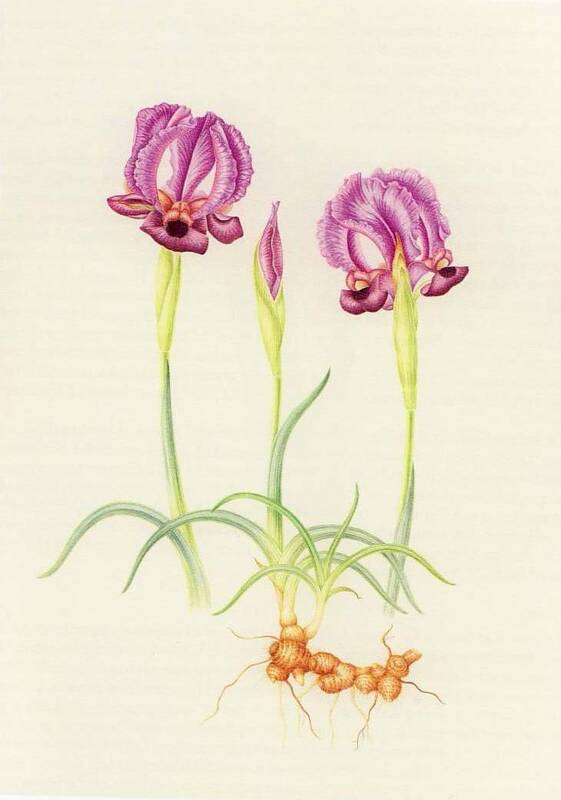 In the last two years I prepared illustrations of a few rare Irises. Employed as a researcher by the Dead Sea Institute, I am participating in several conservation projects. My time is divided between botanical painting and doing ecological research.